Dr. L. Mahadevan completed his post graduation M.D Kayacikitsa, from Govt. Ayurveda Collge, Thiruvananthapuram with high academic credentials. He does intensive research in Neurology and Panchakarma. He practices in Derisanamcope (A village in Kanyakumari dist, Tamilnadu) and in Chennai. He teaches clinical medicine to students. His classes on clinical medicine are unique in nature. He has written 40 books on Ayurveda. He is a student of Dr. B. Vaidyanathan & Dr. M. R. Vasudevan Nampoothiri. Dr. C. Mary Sharmila completed her BSMS graduation from Government Siddha Medical College, Tirunelveli. She is working as a Siddha Medical Officer in Sri Sarada Ayurvedic Hospital, Derisanamcope. She is also a student of Dr. L. Mahadevan’s Gurukulam. Dr. R. Udhaiya completed her BAMS graduation from Dharma Ayurveda Medical College, Sriperumputhur. She is working as a medical Officer in Sri Sarada Ayurvedic Hospital, Derisanamcope. She is also a student of Dr. L. Mahadevan’s Gurukulam. Anyone who has studied Indian medicine knows the tremendous values of various kalpas (combinations). Students, teachers & practitioners consider timeless classical yogas as vital tool in their practice. We have published many books related to this in our career. 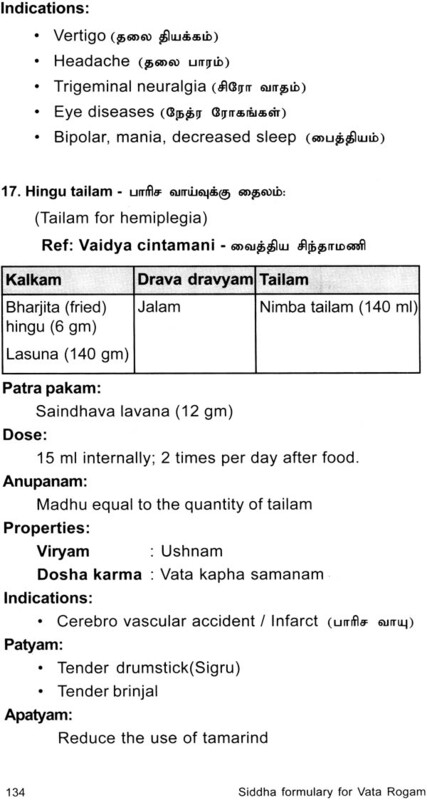 Siddha system of medicine is a traditional medicine developed in Tamilnadu. It is a heritage system of medicine belonging to Dravida Tamil Community. Siddhi is a state accomplished by certain Sadhanas. Even though there are 18 Siddhas commonly talked about, there are more Siddhas in Bharatha. Siddhas belong not only to Tamilnadu but also to Maharashtra, Kashmeeram, Tibet, China, etc., It is a Sampradhaya, it is a holy tradition. Bagavan Agastya Muni is the foremost and the most talked about Siddhar in Tamil literature who is supposed to have learnt this art from Lord Shiva himself. 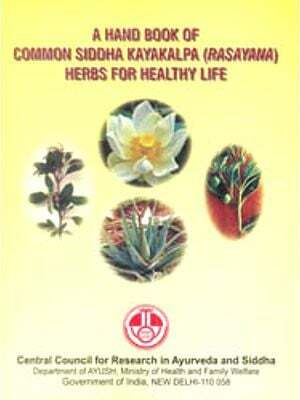 Siddha medicines are not the translation or a branch of ayurvedic system of medicine. 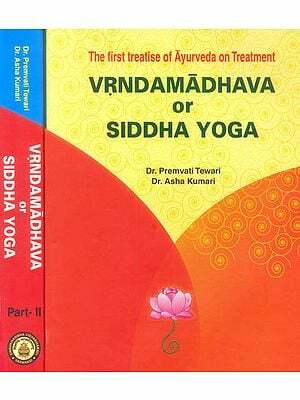 Neither Ayurveda is copied from Siddha system of medicine. Both the systems belong to Indian heritage, culture, tradition and philosophy including Darshanas and they are developed based on the climate and regional identity and on the basis of the availability of flora belonging to Vindhya and Himalayan Mountains. The medicines of Himalayan Mountain are Soumya in nature. The medicines belonging to Vindhya Mountain are Ushna in nature. Every system has got uniqueness. Snehapanam, Mulasiddhantam, Vyakhyanam of texts, Panchakarma Procedures are very strong in Ayurvedic System of medicine. In Siddha system of medicine, medicine preparations, quickness in executing the Putas, short, cost effective procedures in transforming Rasam into Oushadas, availability of plant flora, and usage of small shrubs are the landmark. Here we have done a work, a compilation where we have collected most important yogas from Siddhas literatures namely Kannusameeyam, Anuboha Vaidya Yogam, Abdul Khan Sahib's Vaidyanavaneetham, etc., and translated it into Sanskrit and the Phalasruti has been interpreted into modern terminology which is easily understandable. 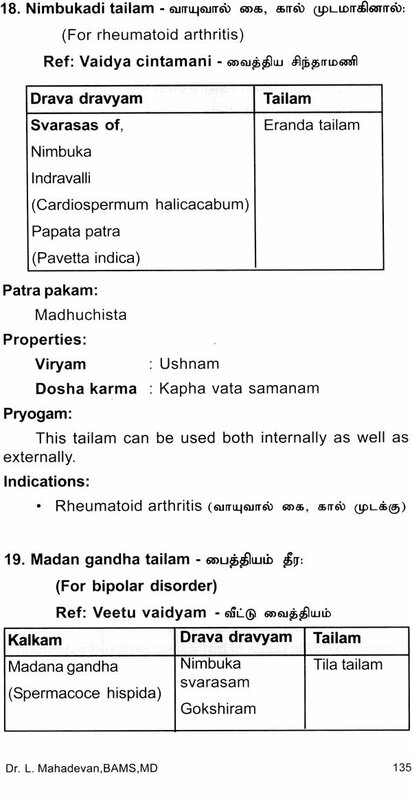 It is not mearly a translation, it is a work of experience as we have been doing Siddha Sadhana for the past 5 years and we have used quite lot of medicines successfully. My teacher Dr. B. Vaidyanathan is a great Ayurveda Vaidya and a great Siddha Vaidya also. We continue to publish Ayurveda and Siddha books and our aim is to make Siddha and Ayurveda globally accepted evidence based system and to create unity and harmony between Siddha and Ayurvedic Doctors. In this work Dr. Udhaiya who is my student has done hard work in taking my lecture notes from the classes I have taken. She is not only my student but also like my daughter. Her father brought her while she was doing third year BAMS and she did not look back, in gaining knowledge from the tradition I belong. The work is supported by one of my another student, a Siddha physician who has been oriented in Ayurveda also by name Dr. Mary Sharmila. She is a dedicated worker, honest, true, sincere, God fearing and she is having keen interest in Siddha and Ayurveda. She is also trained by me in Tridoshic thinking and clinical practice and I am very happy to see my Sishyas doing constructive work and I am happy to the guide to their projects. I thank Mr. Saju, who beside being my secretary is also my friend, philosopher and guide who is with me constantly, transcribing my words into sentences, working day and night to make all this matter available to the community of Siddha and Ayurveda. When I say thanks that becomes an inadequate word but we thank Mr. Saju for his effort, honesty, dedication, sincerity. He is more than a Vaidya, because he has been hearing my classes for the past 10 years and he knows the subject matter thoroughly. Baghavan has sent Saju to me to fulfill certain vision of possibilities in this planet earth during my mundane existence. If the students want to thank my work and if they feel they are benefited by my thoughts and writings they have to thank three people. First they have to thank Dr. B. Vaidynathan for training me, Second, Mr. Saju for making my thought into sentences and making them into book form which is in your hand, Third, my wife, Sarada for patiently supporting all my hard work and for being with me and accepting me. I thank Miss. K. Usha and Miss. M.S. Abiera for their support and efforts. May Bhagavan bless you all with wisdom and I pray with you for the holy presence and blessings of Aswini Devas, Agasthya Muni, Caraka, Susruta, Vagbhata and my own Guru. Let us work together in the future. 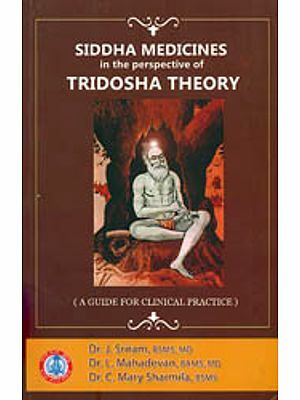 Let our understanding improve, let us practice Tridosha based medicine, talk in Tridoshic terms and create good health based on Tridoshic concepts.